Place of Origin: South America, Amazon and Tocantins River basins. Typical Tank setup: Well planted with rocks and driftwood/bogwood. 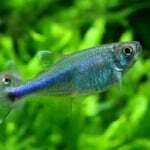 Typical planted/community aquarium will suit the Bucktooth Tetra well. 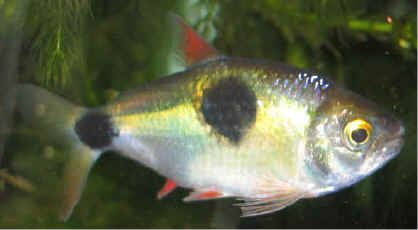 Compatibility: Keep them in groups to limit the fin nipping. 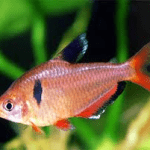 Avoid keeping them with other fish species except in very large tanks and keep them well fed. 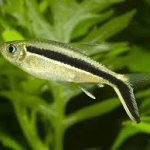 Should be ok if keeping them with scale-less catfish species. 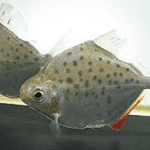 Feeding: Primary diet should be standard tropical flake and will thrive and benefit from being fed fish scales too as this is their base diet in the wild. 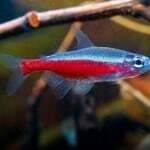 Sexing: No way of telling male from female based on visible external characteristics. 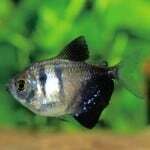 Additional Information: Slightly different from many other fish with it’s primary diet being fish scales, this of course may potentially cause problems in the smaller aquarium if kept with other types of fish unless they don’t have any scales like Catfish or the aquarium is very big. 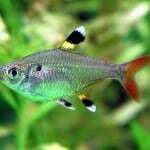 This means generally the Bucktooth Tetra should be kept in a species only tank. 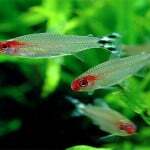 The tank size recommended may seem large for such a small fish however the Bucktooth Tetra is a shoaling fish and so for it to exhibit natural behaviour it is important to give it plenty of room to swim around and a minimum group of 6 is required although 10 or more is recommended.